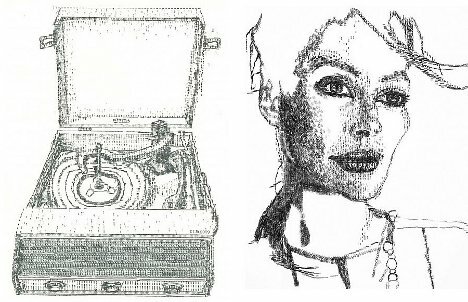 Can you believe a vintage typewriter created this image? Believe it. This unique art is made possible by the ingenuity and creativity of one woman: Keira Rathbone. Keira Rathbone is a vintage typewriter collector, but as you may be able to tell, her collection of old typewriters is not at home collecting dust. Her vintage machines are put to good use! 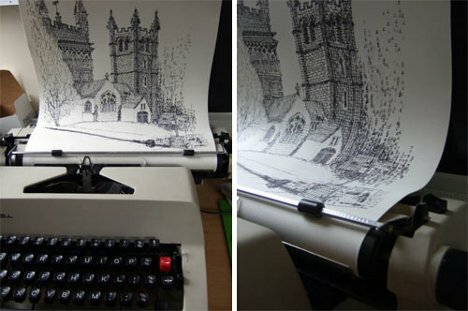 The London based artist creates detailed and unique pieces of art with only a piece of paper and a vintage typewriter. Rathbone has thirty typewriters in her collection. This fact alone is impressive, but how she uses these typewriters to create art is even more inspiring. Rathbone’s style is similar to a sketch. It has been praised and called distinctly different because she is able to go over the same area of the page multiple times with the typewriter’s keys. She goes over and over a page to create shaded areas and white spaces. Others have claimed that her style resembles a digital art style, ASCII. But her typed pieces have an additional dimension that hints at a more traditional artistic style. Another interesting fact about the creative Keira Rathbone is that she does not only work on her typewriters indoors. She ventures out into the world with paper and typewriter in hand. She also wears clothing that reflects the era each typewriter is from. While she works, she chats with those who admire her artistic talent and appreciate the fact that she has saved these vintage machines from extinction. Rathbone has also encountered many who love to reminisce about the glory days of the typewriter. Are you impressed yet? If not, this next piece of information is sure to make your jaw drop: Keira Rathbone doesn’t begin any of her typed pieces with a sketch or an outline. She has a natural eye for how to shade a space on a page to create an image. She enjoys the challenge of creating pieces of art on various models of vintage typewriters. In a day and age when we constantly seem to be doing away with the old, it is nice to know that these vintage typewriters are serving an artistic purpose and delight so many – especially Rathbone. Do you have a unique interest? Can it become your artistic style?